And finally the world has thrust me with the first of YTMP4 series. It’s the video (obviously) downloader site, that allows one to download youtube video. As you may remember, we’ve gone over several YTMP3 sites, including the amazing ytmp3.net, and more popular but less amazing ytmp3.com and ytmp3.cc. Well, now we’re talking about YTMP4.NET. I am breaking the circle where i’ve been talking about best youtube mp3 sites since the biggest at the moment youtube mp3 downloader site youtube-mp3.org was shut down in September 2017 and millions of people needed to find a new place to do the job. But my main passion – saving youtube videos as videos – has been put aside for the few months as of late.. Well, it’s about to change! So let’s dive right into the review. As was the case with ytmp3.net and their revolutionary client-side video to mp3 conversion which really impressed me, this site has done quite a great job impressing me too. Thus I want to cover the good first. I did have negative comments too, so read on! this is the main most impressive item i must list here. I was really glad to discover that ytmp4.net is using youtube-dl to extract the video download link from youtube. what does this mean in general? why do i insist on “results 100% of the time”? to answer that, we must think how does youtube-dl work? the process is simple. youtube-dl imitates a human. so it has a built-in mozilla browser, which youtube-dl simulates opening video in. Then it goes further to simulate the “click play”, and get from youtube the list of streams that are available for this video. From that list then it chooses whatever you prefer or default, and passes that to you. It’s usually a link to youtube video file that is asking to be downloaded. In case of ytmp4.net, the final link leads to 720p HD video (with sound). Well, this actually means that ytmp4.net passes you the link of the video that was about to be watched by a robot on their server. So basically you can be assured – the link is right and leads to the proper video file. 3. Site is very easy to use. Takes only 2 steps or 20 seconds to get the video. It doesn’t overwhelm you with a selection of 20 options, with or without sound, all sizes and stuff.. Site simply passes you 720p HD video link, that has sound by default, and you download from that link. 06-jan-2018 edit: ads are there now.. no popups, thanks on that, but they did come…. If you’re into reading negative thoughts about sites, – check below, i have the things i didn’t like listed after the tutorial. It’s time to put some color into this article and put some screenshots, so let’s learn how to use ytmp4.net. very easy site, fast loading, nice. now we enter the video URL into the only box on the page, and click Get Video button, which is depicted in the next step. if there are any doubts which link or button to click, i have circled it in red. I personally had no problems with UI on ytmp4.net (as opposed to several UI quirks i didn’t like and talked about while reviewing ytmp3.net). Very easy and straightforward. here I’ve just done the screenshot of video being downloaded. again, since the download is happening directly from youtube and googlevideo sites, – it is VERY fast and well.. just super fast… this is something you will never find on huge sites like savefrom or flvto – mega fast download directly from youtube.. =) good job ytmp4.net! 06-jan-2018 edit: it was brought to savetube’s attention, that this point has been looked into and files are now downloaded properly with names set up as their titles. So basically bye bye “videoplayback.mp4” and hello “Properly named video.mp4”. good job! while it is OK if you’re only doing 1 video, but what if you want to download multiple? all of them files will be named videoplayback(*).mp4 and you will need some time renaming them and figuring out who is what. so that is that.. I understand why this happens, has to do with browser file downloads and inability to change the filename.. so i will not be bashing them on this account.. Still thinking average users wants a music video of 5-6 minutes, a video file that long will be 50-60MB at most. Any web browser has that much RAM to allocate, even on old and slow smartphones… So it is something to think about..
since there is no way to select the format, you’re always stuck with 720p. Even if it is a soundless video that you do want in 1080p – you cannot get it using ytmp4.net. I think an almost invisible drop-down with all possible formats (indicating which ones are soundless by default) would be a good feature to add..
Well, this seems to wrap it up… I’ve been talking to the owner and programmer behind ytmp4.net and was assured that tons of new features are coming soon, so let’s keep our fingers crossed, cause ytmp4 could actually become a very very nice tool. Youtube-dl and fast download from google made the 4 star rating from the editor. 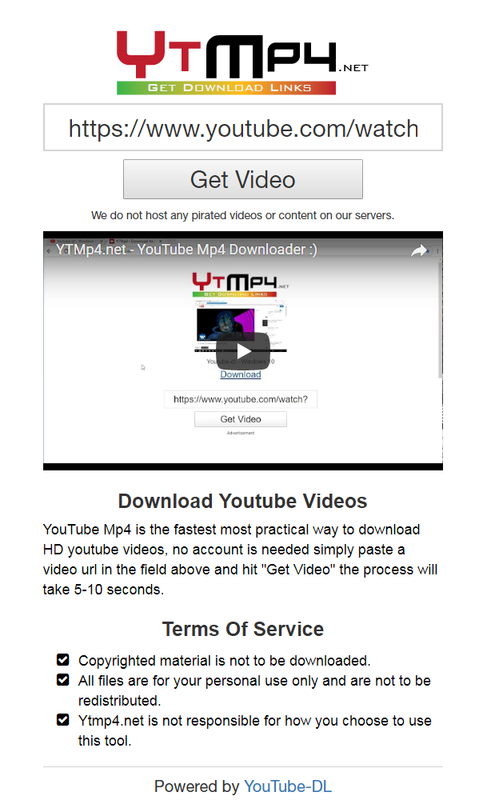 As for all of my readers, – it’s OK and safe to use ytmp4.net (at least at this time).